A throwback to the days before electricity, Chesla's Revenge features "old school" technology, harnessing the power of heat and fire to vanquish its foes! This skin harnesses the fiery power of the infinite burning birthday candles designed by Chesla just before her foray into the more-advanced Chesla Coils. By the time the mouse realizes it can't blow out the candles it's too late! The Chesla's Flame 'n' Fire Skin can be used on the Limited Edition Chesla's Revenge. The weapon's stats (power, power bonus, attraction bonus, etc.) are not changed. 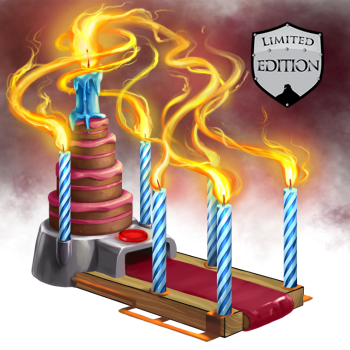 The Chesla's Flame 'n' Fire Birthday Skin may be made available during the annual MouseHunt Birthday event and can be traded on the Marketplace or through Give To Friends. 5 March 2015: The Chesla's Flame 'n' Fire Skin was introduced during MouseHunt's Seventh Birthday. This page was last edited on 9 December 2017, at 09:28.